If you are interested in being a part of Dowell Readers for the 2016- 2017 school, read as many of the books listed this summer as you can! It is open to all 4th and 5th graders, but you need to be a strong reader and be able to remember the details from the books you read. The following letter will be going home tomorrow, October 6th, with Dowell Readers. We are sad that we are unable to have a team at this point, but we are excited with some of the opportunities we are looking into. Please return the form with the bottom filled out if you are interested in participating in the various reading clubs we hope to offer. And as always, keep reading!! Unfortunately, we will not be having a Dowell Reader team participate in the Helen Ruffin Reading Bowl this year. We did not have enough people interested and capable of reading the high level books that is required to compete. We will be doing some reading activities involving the books at a school level, but not in preparation for the competition. If you would like to be a part of lunch bunch book discussions, ASP reading clubs or grade level book clubs, please mark the appropriate boxes below. We will be working on creating these groups in the next few weeks. We will continue to read these fabulous books and share meaningful discussions. We will not meet this Thursday after school, so please plan to go home in your usual way. · The Girl From Felony Bay by J.E. Thompson. Your child has the opportunity to be a part of Dowell’s Helen Ruffin Reading Bowl Team. Dowell Readers is a team of ten 4th and 5th graders who compete to test their knowledge of the Georgia Book Awards Nominees. Your child will read the books and compete to represent Dowell in the CCSD competition scheduled in January, 2016. Students must read independently on or above grade level. This is not a tutoring program. Students will discuss the books and answer questions that they have written about the book. The booklist is on the other side of this letter. The books are available in the media center and at Cobb County Public Libraries. The books are at many bookstores and online. If ordering online, you may want to consider used books. Students considered for the team must read and take comprehension tests on the books. A rubric will be used to calculate points for each student, and they must reach a specified point total in order to make the team. Some ways students can earn points include attending practice meetings, reading the books, passing comprehension tests about the books, and writing questions for the books. Points will also be given if students write summaries (copies of summary sheet will be given to the students) of the books over the summer and turn them in to us when they return to school. If more than ten students meet this requirement, another elimination round may be needed to reach 10 students. We will meet once a week for 1 hour after school beginning the middle of August to practice. Practices will continue each week through January. A signed permission slip and a completed After School Program (ASP) registration form are needed in order for your child to participate. It is not necessary to pay the ASP registration fee ($10) at that time unless your child is planning to attend ASP. The daily charge for ASP is $7. We will keep the form on file for emergencies and late pick-ups (after 3:35). The ASP registration form will be given to students when they turn in the permission slip. Your child must be picked up by 3:35. If your child is not picked up by 3:35, he/she will be placed in the ASP at your expense. A permission slip will be sent home in August prior to our first meeting. It will need to be completed and returned in order for a student to stay after school for the meetings. We are looking forward to a great year with our Dowell Readers! Please let us know if you have any questions. We are so proud of our team! They competed so well and had such a great time! Sth graders, we hope you will join the teams at your middle schools next year, you will be great assets to those teams! 4th graders, we can't wait for next year to see you shine! Be on the lookout for next year's book list to get started reading! PS Our trophies came in with the date wrong, (the kids figured out they would be 99 years old by that date!!). We will send home the new plates when they come in! This weekend is the Helen Ruffin Reading Bowl. The team will meet at Awtry Middle School at 8:30 Saturday morning. Wear your team t-shirt and be ready to compete!! You have all done an amazing job and we are all proud of your hard work!! Don't forget to reread your expert book(s) and practice the questions over the break. We only have two months until our competition! You are all doing really great! We will give each of you a packet of questions to review and use for practice over the December break. We will have practice every Monday that we are in school in December. We are so pleased with how hard everyone worked to become a part of the Dowell Readers. Our team is ready and eager to read and prepare for the competition in January. Keep checking back to this page, as we will post important information, as well as tips and hints to help you prepare. Our next practice is on October 28th. Dowell Reader Books are in!! Stop by the library to check out one of the Helen Ruffin Reading Bowl books. Please remember that you should only have one of the books at a time, so everyone can be reading. If you have one of the books from Mrs. Bartlett, finish that one before you check out one from the library. Don't forget to write your summaries and questions to earn points before October. We had our first meeting on Monday, Aug. 26th. We were excited to see all the students interested. if you were unable to attend the first meeting, be sure to see Mrs. Bartlett, Mrs. Pszczola, or Mrs. Troglin as soon as possible so you can start earning points. Our next meeting is September 9th, 2:30 - 3:30 in the media center. Here are the ways to earn points. You can get the books at the public library, you can sign them out through Mrs. Bartlett, or coming soon, you will be able to check them out at our library. Check back here for when they arrive. 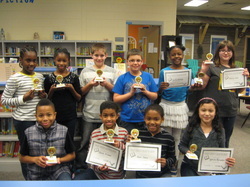 Your child has the opportunity to be a part of Dowell’s Helen Ruffin Reading Bowl Team. 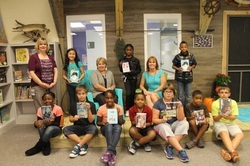 Dowell Readers is a team of ten 4th and 5th graders who compete to test their knowledge of the Georgia Book Awards Nominees. Your child will read the books and compete to represent Dowell in the CCSD competition scheduled for 1/18/2014. Students must read independently on or above grade level. This is not a tutoring program. Students will discuss the books and answer questions that they have written about the book. The booklist is listed below. The books are available in the media center and at Cobb County Public Libraries. The books are at many bookstores and online. If ordering online you may want to consider used books. Students considered for the team have a variety of ways to accumulate points (see reverse side) and they must have a total of at least 150 points by October 11th to be considered for the team. If more than ten students meet this requirement, another elimination round may be needed to reach 10 students. The first meeting is Monday, August 26, 2013. A signed permission slip and a completed After School Program (ASP) registration form are needed in order for your child to participate. It is not necessary to pay the ASP registration fee ($10) at this time unless your child is planning to attend ASP. The daily charge for ASP is $7. We will keep the form on file for emergencies and late pick-ups (after 3:35). The ASP registration form will be given to students when they turn in the permission slip. We will meet on 8/26, 9/9, 9/23, 10/14, 10/28, 11/4, 11/18, 12/2, 12/9, 12/16, and 1/13 from 2:30-3:30 p.m. All meetings are on Mondays in the Media Center. Your child must be picked up by 3:35. If your child is not picked up by 3:35, he/she will be placed in the ASP at your expense. When you are writing a book review it is important to use proper spelling and grammar. You do not want to give away any of the surprises in the book. Think about the following questions to write your review. Remember to use evidence from the text when answering the questions, do not just say “it was cool”. You should explain what made it cool. 1. What was your personal reaction to the book? How did it make you feel when you are reading it? a. Did you just love it? b. Was it exciting? Confusing? c. Did one of the characters remind you of yourself or someone you know? 2. What was the main thing about the book that you really liked (or didn’t like) and why? b. Was there a character you really liked or disliked? a. Who would like to read this book? b. What made the book worth reading (or not worth reading)? c. Why did you pick this book in the first place? Here are some suggestions that you can use to get started. Try to avoid starting with “This book…” or “The book I read…” You want to get the reader’s attention right from the beginning! Remember to always proof read your review before posting it since reviews with poor spelling or grammatical errors will be removed. You can find these books at your local public library, bookstore or download them for your e-readers. The Dowell Media Center has a few copies of some of the titles, but we will get copies of all titles at the start of the next school year. 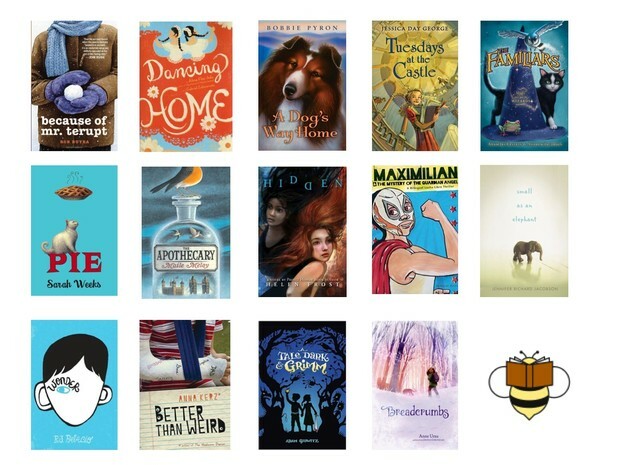 Even if you're NOT interested in the reading bowl, these are great summer reading suggestions for rising 4th and 5th graders!